the best of service along with direct communications. Grand Pointe! what a fantastic place to stay. Best Views on the Gulf Coast!!! Walk into this unit and you will be blown away by the wonderful views afforded by the unique Alabama Point location. View from this 6th floor balcony sweeps from the beach to boats in the pass, to Florida Point on Perdido Key to the east to the Perdido Pass bridge and Marinas to the north. Bring your binoculars and see the weddings on beautiful Florida Point. This view is fantastic in good weather or bad. No wonder this is the view shown on Mobile TV beach cam. Even from the walkway the vista includes Perdido Beach Resort next door, the beautiful homes on Cotton Bayou and the scenic San Roc Cay to the north. On the property you will also find a fitness room,steam room,sauna, indoor and outdoor pools,indoor and outdoor hot tubs and a meeting room. The boardwalk leads to the widest beach on the Gulf. Fish below at the junction of the seawall to the Pass jetties. Scuba or snorkel in the most popular training area on the Alabama coast. San Roc Cay Marina is just across the street to take a fishing trip or to watch the fishing boats unload their catch. You will also enjoy dining and shopping at the San Roc Cay restaurants and shops. This unit has been our personal residence for several years and the extra care shows. 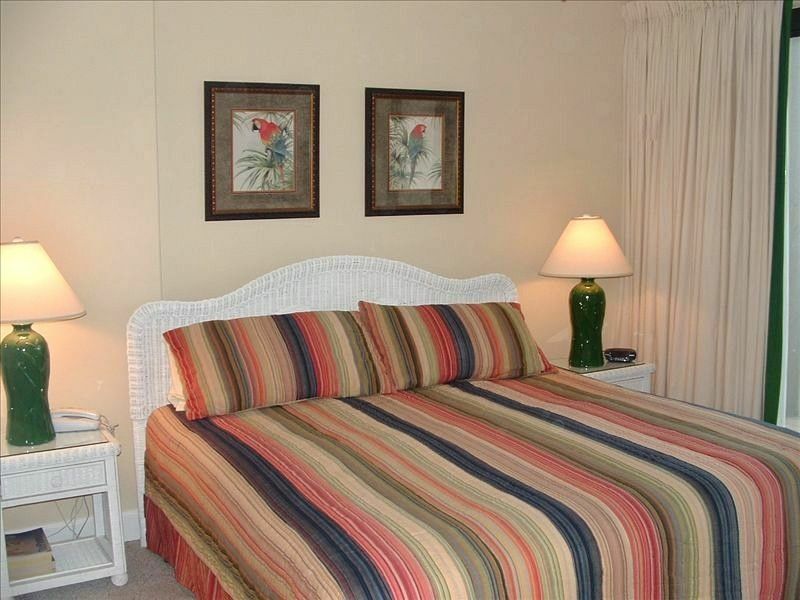 The unit is tastefully decorated and has new paint, new sleeper sofa and love seat for a truly enjoyable beach experience. Has three HDTVs with Direct TV to make those football weekends enjoyable. Wifi is free in the unit. This is a absolutely a no-smoking unit and building. We did live in this condo but now live nearby on Wolf Bay. Beautiful view of Florida Point beach from balcony. Property has board walk to largest beach on Alabama coast. (2) Two pools, Outdoor and heated indoor pool with view of Perdido pass from pool. Can not beat this view and locations! Close to every thing in Orange Beach and Perdido Key. We appreciate you staying at our place again. Thank you. Many thanks to the Nelsons for making our trip a wonderful experience. Prompt response, great price, cozy condo, heavenly view...I could go on and on!!! The layout of the condo is so nice and the color scheme is so pretty :-) With full size washer and dryer, king bed, huge balcony, huge bathroom, and super nice owners...it's a no-brainer, I will definitely be back....hopefully this fall ;-) thanks again to the Nelsons for being so wonderful to us!!! We really enjoyed the beach and the condo. The Nelson's were great to work with, and very easy to get it arranged and checked in. They are great folks. Rent from them, do not rent from Meyers Realty. Loved the view from the room. The gas grills were wonderful too, and there was so much space. Do pick this condo over the others if you want a hassle free stay and to be treated with true southern hospitality. This condo was very well equipped, and the location was fantastic. The Nelson's were very easy to work with , and this has been one of the easiest bookings that I have ever done. The complex is low density and very live able. We really enjoyed the gas grills, the pools, and the beach access. This is a great place to return to year after year. We spent the last week enjoying this lovely condo! The pictures provided are exactly as you will find the unit. The kitchen is well appointed providing everything you will need during your stay. The washer and dryer are full size, not stacked, which is nice. My favorite thing was the HUGE balcony. It is perfect for the early riser who enjoys watching the sun come up. There are always boats coming and going to enjoy as well as marine life. We watched dolphins every morning. The unobstructed view across the pass toward Perdido Key and into the gulf is beyond compare. The property grounds are very well maintained. We found everything very clean and in order. The on-site staff were always there and were so friendly and helpful. The grilling area is shaded and beautiful! Both of the gas grills were in good working order and while using them you can enjoy a great view. The Nelson's are so easy to work with and we were glad to meet them while we were there. We will definitely be returning here for our next trip to the coast!! It is a GREAT place to stay.